THE HISTORIC FRONT gates of Trinity College were damaged this morning, after a car driven by a 68-year-old crashed into them. The incident happened sometime before 6.30am this morning, though the circumstances are unclear. Reports from the scene say that gardaí were at the college shortly after the event. Gardaí in Pearse St confirmed they are investigating the circumstances of the incident. They say a number of cars were damaged when a car drove into the grounds on Trinity College, on exiting the College grounds the closed College gates were damaged. The car proceeded through the gates and drove up Dawson St where a number of other cars were damaged. It was stopped by gardaí on Dawson Street. The man was arrested and was taken to Store St Garda station. A statement from the college said the man followed a cleaning van into the college. “The car drove through the Front Gate, following a contracted cleaning van that was entering the College. “Despite College’s Security’s efforts to stop the car, it drove onto campus. Pursued by College Security it drove through the front section of the College and then drove back towards Front Gate which had been closed by College Security. However, the driver proceed to ram into the historic entrance a number of times, succeeding eventually to break through it and causing damage. “The driver then proceeded to drive on to Dame Street, followed by Nassau Street and against the traffic on Dawson Street where he was arrested by the gardaí at approximately 6.35am. 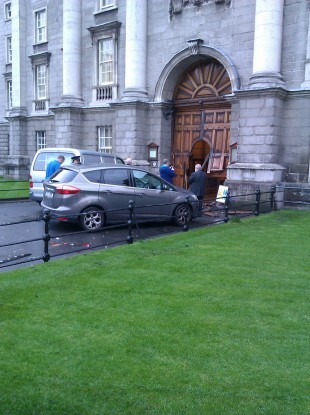 Email “Car driven by 68-year-old crashes into the front gate of Trinity College”. Feedback on “Car driven by 68-year-old crashes into the front gate of Trinity College”.